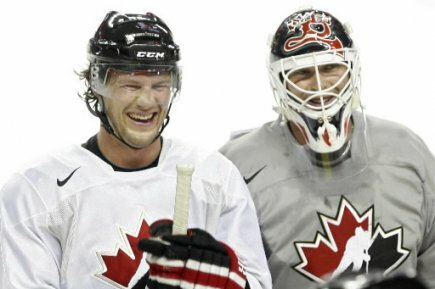 With the booming news that both Shane Doan and Martin Brodeur are going to test the free agency market is something that many have had people gasp in astonishment. More with the latter, but overall-- it just proves that almost nothing is sacred or protected when it comes to trying to get paid or putting yourself in a position to win again. For Doan, the equation is simple: the unknown that is the Phoenix Coyotes' ownership issue is the main thing that is going to push Doan to look at his options. It's not that the league wouldn't provide the money for Doan to be re-signed, it's a matter of Doan trying to get into a stable place where he knows he won't be picking up and moving after next season. More over, Doan could have seen last year as possibly the closest he would get to the Stanley Cup with the team he's with and may want to go to a place where he knows he could be in contention for the duration of what could be his last contract. The news of Brodeur hiring an agent like Pat Brisson is considered a serious ideal that the long-time Devils' legend could be on his way out. Of course, Brodeur had his father representing him for his career-- so the addition of Brisson, one of the biggest power brokers in the game, will turn heads and maybe make the Devils dealing with Brodeur much harder to deal with. Considering that Brodeur is 40-years-old, who knows what kind of contract he's looking for and what kind of role he would want to play with that team. If a Western Conference team were to get into the mix, the risk of travelling could be something that could hinder their look at Brodeur, as he has been graced with close quarters of the Atlantic Division and Eastern Conference. Yet, you have to wonder what this means when it comes to the last of a dying breed when it comes to the loyal players being with their teams for the duration of their careers. Of course with Doan, it's an extenuating circumstance that has him on the lookout for a new team, but it is a bit of a downer to think he won't be on the Coyotes roster if things can't get sorted out between the two. But with Brodeur, you would have thought that this is a guy who would have been a Devil from start to finish-- which could still be the case with Brisson only being brought in as leverage to get a better deal or to actually gauge his true worth. However, this could be the closest ever to Brodeur leaving-- which should be scary to fans and team management alike with not much going on with goaltender development in their future. The idea of the long-term deals with the young players is almost a forceful push to get them to be the franchise player with that deal. It's almost, however, that without that long-term deal; the loyalty aspect of it all is going by the wayside-- if it hasn't already. Though, the shocking effect that these two long-time franchise faces possibly going out on their own could make a lot of hockey fans forever give up on the idea that a player will be with the franchise from start to finish, especially in a salary cap era. But it goes back to that old adage-- if Wayne Gretzky can get traded, anyone can. We've seen it happen with Rick DiPietro, we're seeing it happen with Roberto Luongo, will we see it with Jonathan Quick?? The "it" in question is the pressure of a long-term deal getting to the performance of a goaltender as the contract carries on and the goalie possibly not living up to the potential and money. Of course, if you hadn't heard and laughed along with Twitter; Quick is going to sign a contract extension with the Kings for 10 years worth $58M. While Quick is coming off of a Conn Smythe Trophy and Stanley Cup winning season, as well as being a very solid performer during the regular season; a raise of that magnitude is one that could make the most harden of Kings supporters scratching their heads. And it's a great point, because, if anything, the goaltending position could be the most volatile as any position on the ice. Hell, I've made a weekly point to show off all the goalies who had a promising upside to them, but were unable to actually get it done when push comes to shove. Not only that-- but the injury rate for goalies could be a little higher than other position players, as they are out there all the time and have to be a little bit more flexible than their teammates. Even so, the examples I cited prior are prime examples of how long-term deals not only hurt the team, but could hurt the player's psyche and make the team a little bit of a laughingstock in the end, as they are hamstrung to get rid of the deal. With the DiPietro deal, we all knew Islanders' owner Charles Wang was a little on the nutty side, but to give a goalie who is oft-injured (putting it lightly) a 15-year deal (albeit at only a $4.5M cap hit) was a bit ridiculous. You can't blame DiPietro for taking the money and running, if it's offered out there-- why not?? But the pressure on him to do something about it is way to high and it wouldn't be as lambasted as it is had DiPietro actually put up a performance.....of any kind. Though, we can probably blame genetics for him only playing 47 games in the past four seasons. Yet, even the goalies who succeed aren't prone to controversy as we see Roberto Luongo getting the bum's rush out of Vancouver after signing a 12-year extension which started in the 2010-11 season. With his playoff short-comings (sans the 2011 Playoffs, even still with a little help from Cory Schneider) and the play of Schneider-- the Canucks fans seem ready to let Luongo go. Plus, with Schneider signing a three-year extension worth $4M a year-- it seems the Canucks are just waiting for a viable suitor to come along for Luongo and his $5.33M cap hit. Quick will be on the hot seat next year, as his $1.8M cap hit will go away and people will wonder if the 10 years beyond that will be worth it or not. If he performs as well as he did this year, it could ease some minds. However, watch out if he starts to falter quickly and doesn't seem to regain form. It's a shock that Dean Lombardi, who has looked like a genius when it comes to getting the right personnel on his team to win, would do something with such a lofty expectation for that position which has the most pressure put upon it. For his sake, he better know what he's doing lest he get fired as a result. Considering that many thought what the Winnipeg Jets gave Ondrej Pavelec was a bit on the crazy side, you have to think that the Kings looked at that as market value and since Quick was better than Pavelec statistically, he was worth the terms given. If anything, Carey Price is licking his lips and wringing his hands when it comes to what he could possibly get for his new contract-- especially if he gets an offer sheet. While the man between the pipes could be the most valuable on the team, the risk of giving him a long-term extension is very high, even if the reward is there as well. You cannot blame these guys for taking the terms and money-- they are playing a sport where they excel and the general manager is the one who sets the value for their services. However, the pressure to perform is going to be there and if they don't live up to it-- they will be looked down upon-- rightfully or not. It's a double-edged sword they're dealing with, as a lot rests on their shoulders. For Quick, all he has to do is look at those before him and hope he doesn't fall into that same chasm. Andrew Greenstein of the fantastic jersey database website NHL Uniforms put out a great post about many teams getting rid of their alternate jerseys, namely the Edmonton Oilers, Buffalo Sabres, and Florida Panthers-- as well as the lack of possible announcement of any new alternate jerseys coming to the forefront. More over, the fact that many of the alternate jerseys have gotten so popular or bought more often-- they have been moved from alternate to the regular home jersery. In fact, the Los Angeles Kings, Dallas Stars, New York Islanders Philadelphia Flyers, Sabres, and Oilers have recently had their alternates move to their full-time home jerseys. Many thought the Nashville Predators were supposed to make their old alternate jerseys into the full-time look before they went with a full-gold presence. Also, the Anaheim Ducks seem to be rolling out their alternate more and more; that could get a road counterpart in the next few years. 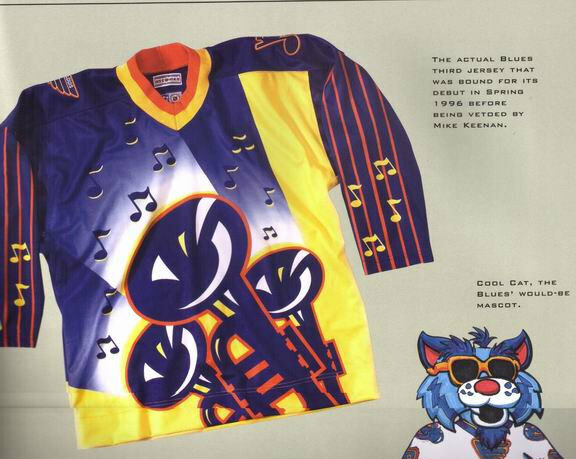 However, the history of the third jersey is pretty interesting to say the least. The first instance of an alternate jersey was the 1955-56 season when the Boston Bruins used their white, black, and gold motif. They used that for two years, but would stop it in the 1957-58 season, only to bring it back for the 1959-60 season and have it last until the 1964-65 season. They were the only team in that era to use three jerseys in their wardrobe. The next recorded instance of an alternate is when the Toronto Maple Leafs introduce new home and road jerseys, but kept their old home jerseys as an alternate in the 1970-71 season. It was merely a transition from old to new, as they would go away the next season. It was another 11 seasons before there was another alternate jersey, when the 1981-82 Pittsburgh Penguins worked in a gold jersey to their repertoire, which would last for two seasons, before the gold jersey became the home jersey in the 1983-84 season, lasting just one season, however. 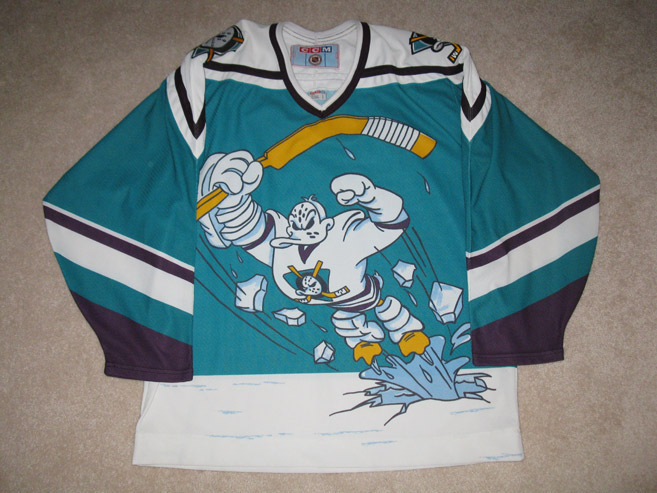 Discounting the entire 75th Anniversary celebration by the NHL where the Original Six had alternate/retro jerseys for the 1991-92 season; the biggest boom and the start of the wide-spread third jersey craze was in the 1995-96 season with five teams kicking off the program (Mighty Ducks, Bruins, Canucks, Penguins, and Kings) and from that point on-- there was quite the boom for teams, as they saw how much of a great money maker it was....except the Blues. Most Seasons With Alternate Jersey: 23, Boston Bruins. While Greenstein has a point that it's interesting some alternates may be getting less and less prominent and some could be taken out of full rotation while others are being put into it-- the debate on whether or not they are going away is going to be there. They still are something people will clamor to have, and while some will be put into full rotation-- it just gives the team another reason to make another jersey in order to make even more money through merchandising. 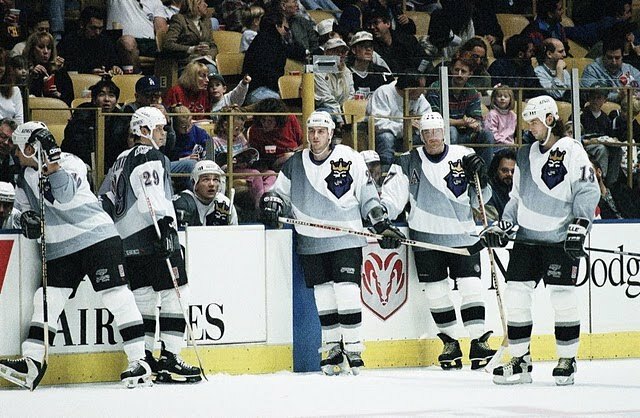 Plus, as well have seen in the past-- even the bad alternate jerseys are looked back at fondly, as we've seen with the Wild Wing and Burger King jerseys. Even if they're going away, the fact more people than not will buy the new jerseys regardless of their look is going to be something teams remember and exploit (to a point) when trying to market them to not only their own fan-base, but the jersey collectors alike. This draft weekend has passed and there's many who wonder what will happen to most of these prospects. As we've seen from this segment, sometimes it doesn't pan out as planned. However, this story is equally as tragic. This week's AGM was passed over in the draft, only to gain his spot in the World Juniors over two drafted and future Stanley Cup winners, only to not live up to expectation as many had thought. This week, the profile of Mike Fountain. The 1988-89 season is where Fountain would start with in the Junior "C" ranks with the Huntsville Blair McCanns in Ontarion, going 18-3-2 in 23 games. The 1989-90 season would have Fountain in Junior "B" with the Chatham Micmacs for 21 games (no record given), but would take home the Western Jr. "B" Championship. Moving to the Major Junior ranks, Fountain would start in the 1990-91 season with the Sault St. Marie Greyhounds for seven games (5-2-0) before being traded to the Oshawa Generals to round out the last 30 games of his season, going 17-5-1. Fountain would stay with the Generals in the 1991-92 season, he would go 18-13-6 in 40 games. Fountain would also beat out the likes of Martin Brodeur and Chris Osgood to be the back-up of Trevor Kidd for the Canadian World Junior team, but not getting into a game. That summer, Fountain was drafted 45th overall by the Vancouver Canucks after being passed over in his last two drafts. Fountain would start the 1992-93 season with the Canadian National team, going 7-5-1 in 13 games; as well as winning the Spengler Cup with Canada. After the Spengler Cup, Fountain moved to the AHL and the Hamilton Canucks, playing in 12 games to end the season and posting a 2-8-0 record. Fountain would spend the entire 1993-94 season with Hamilton, finishing with a 34-28-6 record in 70 games, then going 0-2 in three playoff appearances. The Canucks moved their affiliation to Syracuse and became the Crunch, which is where Fountain would be for the 1994-95 season, posting a 25-29-6 record in 61 appearances. For the 1995-96 season would be a struggle for Fountain in the regular season (21-27-3 in 51 games), but had a decent playoff outing with a 8-7 record in 15 games. It was a turnaround for Fountain, of sorts, in the 1996-97 season; going only 8-14-2 in 25 games with the Crunch (plus 0-2 in two playoff games); but Fountain finally got his NHL chance with the Canucks-- posting a 2-2-0 record in six games, including becoming the 19th goalie to start his career with a shutout win, as well as missing an empty net goal in his 3-0 win versus the Devils. 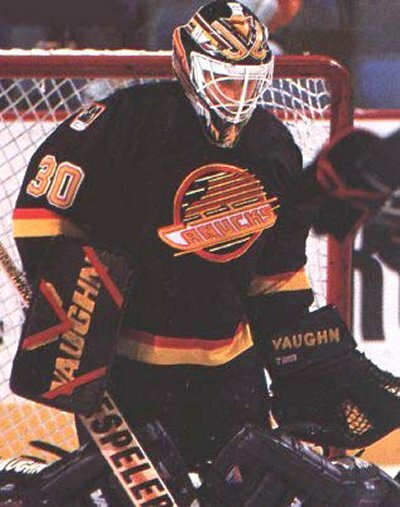 Fountain was shuffled in the Canucks depth chart and moved onto the Carolina Hurricanes in the summer of 1997. Fountain would stick in the AHL with the Beast of New Haven for the bulk of the 1997-98 season; going 25-19-5 in 50 appearances, while spending three games with the Hurricanes-- losing all three.The 1998-99 season saw Fountain back with the Beast of New Haven, going 23-24-3 in 51 appearances. 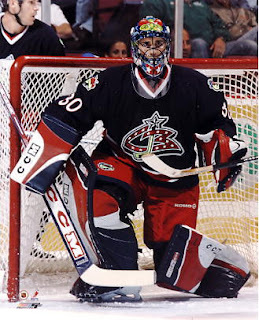 Signing with the Ottawa Senators organization in 1999, Fountain went to the IHL's Grand Rapids Griffins for the season-- playing in 36 games and compiling a 21-7-4 record, while geting a no-decision in his one appearance in Ottawa that season. The 2000-01 season had Fountain playing solidly in Grand Rapids finishing with a 34-10-6 record in 52 game and then going 5-3 in eight playoff games. Fountain would play in one game in Ottawa that season, which was a loss. After that season, Fountain went on a European vacation starting in the 2001-02 season, first to Russia with Lada Togliatti for two seasons, playing in 64 games total and posting 19 shutouts in two seasons-- including 14 in 2001-02; which was a Russian League record. Fountain then to Germany in the 2003-04 season with the Iserlohn Roosters for 34 games before moving back to North American to sign with the UHL's Motor City Mechanics for the 2004-05 season-- playing in three games (all losses). After that short stint, Fountain completed his 2004-05 season with the Russian 2nd League for Mechel Chelyabinsk for 17 games and posting five shutouts. After a year off, Fountain returned to Russia and Lada Togliatti for the 2006-07 season until the 2008-09 season, playing in a total of 84 games over those three years-- posting six shutouts in that span and averaging a 2.43 GAA. Fountain would retire after that. Since then, Fountain has kept going on the teaching route. During his playing days-- Fountain would be an instructor for various schools-- including Roger Neilson's hockey school. Fountain has also worked as goalie coach for the USHL's Muskegon Lumberjacks. Currently, he is working as the hockey director for the Walker Ice and Fitness Center in Walker, Michigan where he oversees the Learn to Play, Learn to Skate, and Hockey Association of West Kent. While he did beat out two potential Hall of Famers younger in his career, the shuffle and mismanagement of some teams are what stunted his development and gave him a glass ceiling he never could seem to break through. However, Fountain made his time enjoyable, having some solid seasons and dealing with the hardships of others. Now, he's passing onto others the wisdom of his travels. While this AGM did have some kind of prominence, it was with an expansion team. A once highly rated prospect, he was let go to the expansion team and moved onto an adventure of his own. While he didn't have the best career path, he did what he could with what was in front of him. This week, the profile of Marc Denis. Denis' quest started in the 1992-93 season playing Midget "AAA" with Montreal-Bourassa for 26 games before moving onto the Trois-Rivieres Estacades in the 1993-94 season, putting together a 10-22-3 record in 36 games and 1-3 in the four playoff games he appeared in. Denis started in the Major Junior ranks with the Chicoutimi Sagueneens in the 1994-95 season, playing in 32 games and putting up a 17-9-1 record and then going 4-2 in six playoff games. The 1995-96 season saw Denis get the starting role in Chicoutimi, playing in 51 games and posting a 23-22-4 record, then finishing 8-8 in 16 playoff games. Denis also played in the 1996 World Junior Championship, going 2-0-0 in this two games en route to Canada winning the Gold Medal. It was another big year for Denis in 1996-97, going 22-15-2 in 41 games, then 11-10 in 21 playoff games, as they won the QMJHL Title. The Sagueneens would go 0-3-0 in the Memorial Cup, however. Denis also played in the 1997 WJC, going 5-0-2 in seven games winning another Gold Medal. Denis was the best goaltending in the World Junior tournament. There were more awards for Denis that spring with him winning Canadian Major Junior Goalie of the Year award, as well as named to the CHL and QMJHL First All-Star Team. Also during that 1996-97 season, Denis made his first appearance with the team that drafted him in 1996, the Colorado Avalanche, losing his first game in December of 1996. Denis also joined the AHL's Hershey Bears for the 1997 Playoffs, going 1-0 in four appearances, as the Bears would win the Calder Cup. Denis' first pro season was in the 1997-98 season with the Bears, where he would play 47 games and put up a 17-23-4 record and then 3-3 in six playoff games. In the 1998-99 season, Denis would be back in Hershey and finish up with a 20-23-5 record in 52 games and then 1-1 record in three playoff games. Denis was called up for four games with the Avalanche where he would go 1-1-1 in that span. Back-up duty called for Denis in the 1999-2000 season, as he would be playing behind Patrick Roy. Denis would put together a 9-8-3 record in 23 appearances. Before the 2000-01 season, Denis was traded from the Avalanche to the expansion Columbus Blue Jackets for a second-round choice. Denis played 32 games that season and finish with a 6-20-4 record. In the 2001-02 season, Denis played in 42 games, but only put up a 9-24-5 record. The 2002-03 season, Denis moved into the starter's role and played 77 games and put up a 27-44-8 record in that time. In the 2003-04 season, Denis' time shrunk with only 66 games in the cage, but had a 21-36-7 record to show for it. While he took the 2004-05 lockout season off, Denis returned to Columbus for the 2005-06 season and put together a 21-25-1 record in 44 games. Denis also played for Canada in the 2006 World Championship and would go 4-1-0 in five games for Canada's fourth place finish. In the summer of 2006, Denis was traded from Columbus to Tampa Bay for Fredrik Norrena and Fredrik Modin. Denis stayed with the Lightning for the 2006-07 season, compiling a 17-18-2 record in 44 games. The 2007-08 season had Denis start out in Tampa, posting a 1-5-0 record in 10 games, but would be relegated to the AHL's Norfolk Admirals, finishing there with a 11-17-2 record in 32 games. Denis signed as a free-agent in the summer of 2008 with the Montreal Canadiens, mostly playing that 2008-09 season with the AHL's Hamilton Bulldogs, playing in 46 games and finished with a 27-18-0 record and then 2-4 record in six games. Denis did play one game with the Canadiens, which was a no-decision. After a summer with no offers, Denis hung up the pads. After his playing career, Denis would go on to become a goalie coach for the Chicoutimi Sagueneens in the 2009-10 season, while then moving over to become an analyst for RDS in Quebec. It wasn't the easiest of rides and may not have had the best of teams, but he showed that if he does have a good team in front of him, he could be productive. Even with mediocre teams in junior, he could lead them to a league championship. The odd death-kneel was the expansion team woes, which didn't see him climb out of that issue with flying colors. Coaching changes, culture changes, and personnel changes-- the Los Angeles Kings had a roller-coaster season. 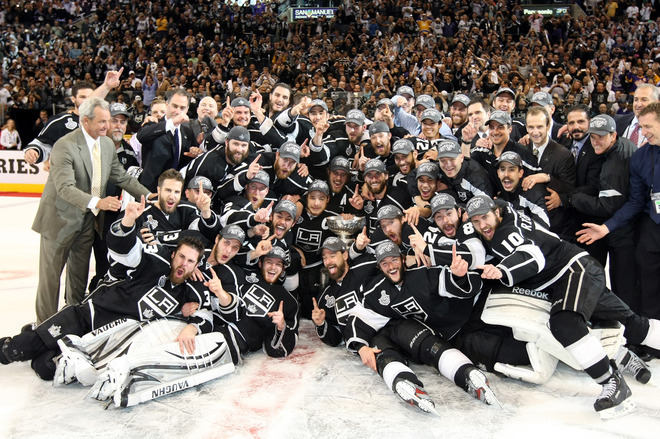 At the end of it all, the Kings became the first 8th seed in the playoffs to win the Stanley Cup. Sure, they didn't play like a 8th seed and were a couple wins away from being the 3rd seed. Yet, the end of it all-- the Kings made a lot of history for their organization-- a Stanley Cup for the first time in 45 years. 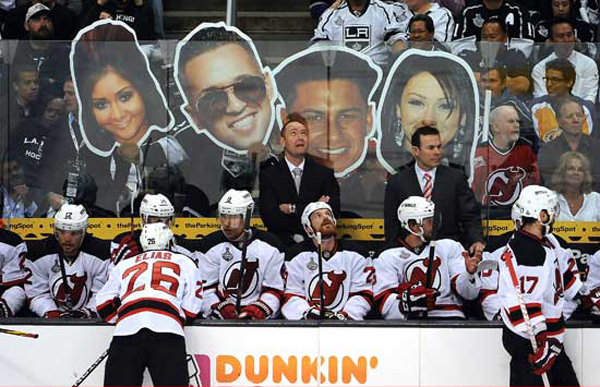 One of the biggest changes was the Kings dumping Terry Murray from behind the bench for Darryl Sutter. Sutter was a guy who was able to give the team an identity and allow them to make the run like they did. The work ethic for Sutter is second-to-none and to have an entire team buy into as quick as they did shows that they knew it was the right time for them. However, the reason Jonathan Quick was the Conn Smythe Trophy winner is the same reason why the Kings were solid throughout the season. Quick has the chance to win the Vezina and really was able to stifle any competition, even when people thought they had "the book" on him and knew how to score on them. Quick outwitted shooters and really kept them uneasy through the season. 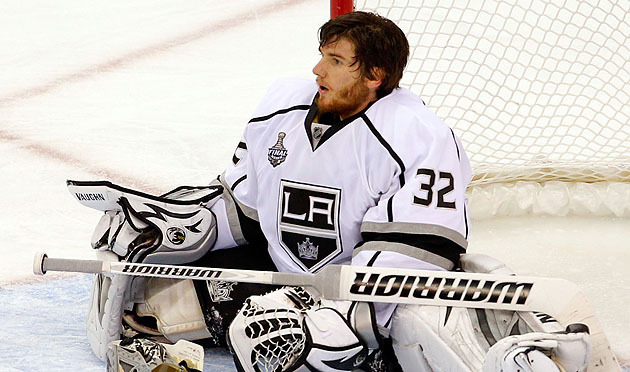 Yet, the biggest thing for the Kings was the fact they slowly became the Philadelphia Flyers of the West coast. With a line-up that had Mike Richards, Simon Gagne, Jeff Carter, John Stevens (assistant coach), and Ron Hextall (assistant GM); the City of Brotherly Love had its hockey icons well represented in this Cup victory. Also, Justin Williams spent a time with the Flyers several years ago and GM Dean Lombardi was a Flyers' scout before he got the GM gig in LA. Most importantly though, the Kings output from top to bottom-- Dwight King was a hero for a time, Trevor Lewis had two goals in the clinching win, Dustin Penner was johnny-on-the-spot, and Jarret Stoll was crucial in the face-off circle. Along with Colin Fraser as the leader of the fourth line, the role players got their due-- as they would in a Sutter system. Yet, you can't say enough about the bigger stars like Dustin Brown, Anze Kopitar, and Drew Doughty. Brown, a hot button of trade rumors early in the calendar year, book-ended the playoffs with big performances to start and end the playoffs. Kopitar showed that he is another West coast star who may not get the due he deserves. Doughty's hold-out gave him the legs in order to be one of the faster guys out there by the Finals....or so conspiracies would make you believe. 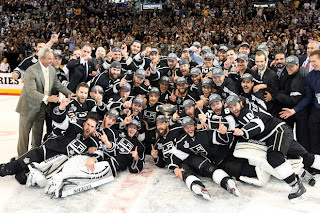 Everyone was give a role, everyone played their role, and the Kings won the Stanley Cup in 20 games-- 16-2, 10-1 on the road, and took home the Cup in six games.....like I said. In what was almost a great ending for the old guard that is Martin Brodeur, the New Jersey Devils got behind in the Finals early and couldn't dig out of the hole. The Devils, though, as a sixth seed and fourth in their division showed they still had something left in them. The biggest question now is whether or not they'll be able to retain their captain and franchise face, Zach Parise. The impending UFA will get a lot of offers and considering the Devils are hamstrung with the Ilya Kovalchuk contract for the next while, the room for Parise and goaltender Brodeur is slim at best. Not only Parise and Brodeur, but guys like Ryan Carter, Steve Bernier, and Stephen Gionta-- all of whom have made a name for themselves in the playoffs-- plus Bryce Salvador still need to be signed, as well as a possible back-up goalie. While the Devils have $28M in cap space, you have to think Parise will look for at least $8.5M, leaving 20 to spread around. While Brodeur says he'll be able to hang around for another year, I have my doubts. The only saving grace is that Brodeur was able to play less than 60 games, which probably bought him another year. However, if the Devils want to get back to this position, they'll need an experienced back-up like they had in Johan Hedberg; though the price tag could vary. Development could be key, especially if Parise is re-signed and then there's no room for a high-priced goalie. It's going to be all about dollars and sense and while the Devils gained a lot of fans by eliminating some of the teams they eliminated, the fact remains if they can't get Parise and/or Brodeur under contract; it could be difficult to achieve this again. Luckily, Peter DeBoer seems to be able to adapt to situations he's put into with this Devils team and will be able to adjust accordingly. The thing is how much of a vacant hole there will be or how little breathing room with the salary cap there will be?? Some of these AGMs come just by looking up things online and stumbling on a name. This week's AGM was a different adventure and someone who I wouldn't have thought of doing unless sparked by this. As a birthday gift, my wonderful friend Jen Conway got me the picture above; as she knows I like goalies and obscure ones. As I looked into it, he may not have left the midwest, but he had himself a nice little career from it. This week, the profile of Mike Curran. Coming out of International Falls, Minnesota; Curran was an All-State goalie and led his high school team to a pair of Minnesota State high school championships, as well as posting a 0.78 GAA in the 1960-61 season, a record that still stands today. After playing a year in the USHL for the Green Bay Bobcats; Curran moved to the University of North Dakota starting in the 1965-66 season. Curran played three seasons and had a record of 54-28-4 in 86 appearances. 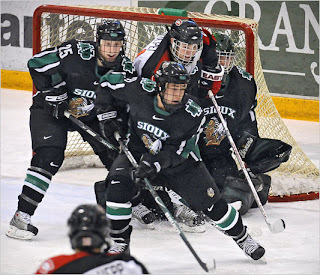 Curran would also lead UND to two WCHA Championships, and two NCAA finals bids-- losing both times, first to Ken Dryden and Cornell Big Red and the second to the Denver Pioneers. Curran is 4th in all-time wins at UND and is top-ten in games played, goals-against average, save percentage, and saves. After that season, Curran would move onward to the United States National Team to prepare for the 1972 Winter Olympics. Curran played in the 1969, 1970, and 1971 World Championships, while moving onward to play for the United States in the Winter Games, leading them to a silver medal and being named MVP of the US team for his performance. Following his time with the US team, Curran moved to the WHA, where he was selected be the Minnesota Fighting Saints when the league started in the 1972-73 season, where he would go 23-17-2 in 44 games and play in the 1973 WHA All-Star Game. In the 1973-74 season, Curran stayed steady with a 23-14-2 record in 40 games, but by the 1974-75 season; Curran would see his time dwindle (due to an upstart and former AGM named John Garrett) playing only 26 games and registering a 11-10-1 record. In the 1975-76 season, Curran only played five games with a 2-2-0 record; as the Fighting Saints would suspend operations 59 games into the season. Curran would also play nine games in the NAHL with the Johnstown Jets with a 7-2-0 record to show. Curran played in the 1976 Canada Cup for the US for three games with an 0-2-1 record. The Fighting Saints reconfigured for the 1976-77 season, but Curran would only see 16 games of play (4-7-3), as this Fighting Saints would fold 42 games into the season. Curran went to the AHL with the Rochester Americans for nine games and compile a 1-4-1 record. Curran would retired after that season. 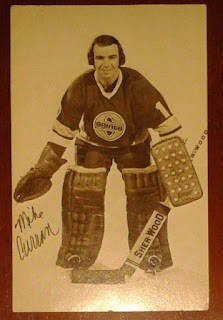 USA Hockey named Curran the Goalie of the 1970s for the organziation; participating in seven international events for the US. He was elected into the US Hockey Hall of Fame in 1998, as well as being elected into the IIHF Hall of Fame in 1999. Oddly enough, if not for someone know my love for the obscure and absurd between the pipes, I wouldn't have known about Curran's topsy-turvy time through the WHA and then representing his country as much as he did in the international field of play. Even though it all, the consistency and surprise of what he did with the 1972 Olympics will shine on for the longest time for amateur competition. 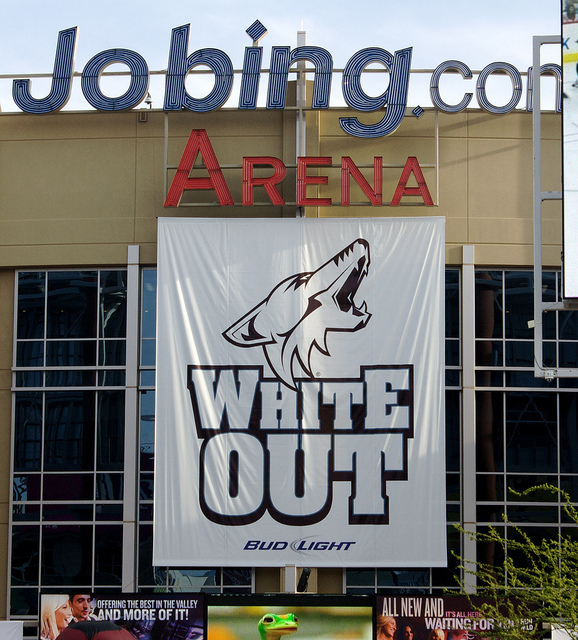 The Glendale City Council voted 4-2 in favor a new 20-year lease with prospective Coyotes' buyer Greg Jamison, which would see him buy the team after three years of bankruptcy and maybe closing a saga in this whole shebang. Of course, the Goldwater Institute, who failed at a restraining order, could have some push still-- as while they did fail to get the vote stopped, did learn that the City of Glendale could be held in contempt of court for violating a previous court order to show the meetings that the city had with any buyer. According to a study, Glendale would pay Jamison $203 million during this lease while bringing in $45M in revenue because of it, while it would take $177 million and cost many of jobs to buy out the lease should the Coyotes move. 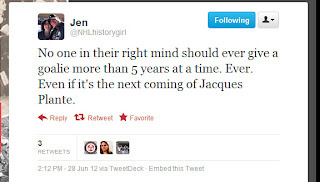 To be honest, I'm sick of this ordeal-- as I'm sure many hockey fans are because this has dragged on forever. Leave, don't leave-- who cares at this point, it's beyond exhausting. Though, someone in the TSN comments section (crazy, I know) did offer up some kind of food for thought. If the NHL was so concerned with the city of Winnipeg actually getting the support from the city when it comes to their new hockey team-- why wouldn't they at least see if they can sell a set amount of number of season tickets to not only show the city of Glendale they're fighting the good fight, show Jamison that he's actually going to have a good investment, and give the other NHL cities and pundits who hate the Phoenix fiasco a reason to shut-up because the Coyotes would have a solid crowd for their games rather than empty seats we see game-in and game-out from the Getty Images after the game. Plus, it would give the fans the chance to show that they aren't a bunch of ham-and-eggers and really give them a reason to be proud of their team and themselves for actually putting up a fight...and long fight....and succeeding and then having a reason to stay around for a while and support the team they emotionally fought for. It would assure their team stays around and won't get chirped by anyone else. Sure, the Jobing.com Arena is in the middle of nowhere, despite the city trying to build up the area-- and I get that it could be difficult for people in outer-lining areas to access the arena, but at the same time-- why did the team do that knowing the difficulties they would have had to get people out there. It's almost like this whole thing was a set-up for failure. 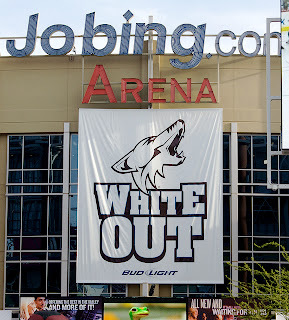 That said, the NHL just wants the Coyotes off their hands. The fact of the matter is that the quicker Gary Bettman gets this off his hands, the quicker he can get onto more pressing matters-- like if anyone would get to play next season in the NHL. A ticket drive for Phoenix is not on the horizon, though it might be a good rallying cry to the fans to actually show this fight wasn't for naught. Plus, it'd give something for Bettman to hang his hat on if they actually fill all the spots. Yet, if it doesn't fulfill, it'd be egg on the face of Bettman, Phoenix, Jamison, and everyone involved. It's just a shame that one fan base who actually craved a team after it was taken for him have to prove their support and dedication to a team (and did it in quite a rapid fashion), while another area is just allowed to keep the team because they're already there and it's easier than trying to move to another locale that's not ready. And honestly-- the same should be done for other teams in financial straits. If the fans want to keep their team, they'll be able to buy the tickets to show the support, or they'll have to support another team. Just because you have the building doesn't mean you deserve the team. Good luck to all involved, but if this drags on any longer-- I can bet I won't be the only one to flip tables in anger. One of the biggest things you see that unique to the college hockey game isn't always the marching bands, but the fact they have full-facial protection for their players, whether it be a full visor or cage. However, with a possible rule change, that may all come to an end. Every two years, the NCAA rules committee looks at the game and see how they can tinker here and there. Not only are they looking at overtime, but they're also looking at the face of the players. There has been a movement for players to go from a full-face protection to the "aviator" three-quarter shield. In a world where the idea of eye injuries are being batted back and forth in the professional level, it makes you wonder if the NCAA is making this move to help their players progress or regression in the face of safety. Granted, the aviator design will be a little more protective than the regular visor, it still is much less protective than the full covering they had. Though, outside of midget hockey, NCAA is only league that requires a full-face protection for their players over the age of 18. Even the USHL and NAHL, both junior programs that USA Hockey governs, have the ability for players over 18 to ditch the full protection....I think, their rules aren't up on their website, but I would assume it's the same rulebook as the USA Hockey. Even with the Canadian Hockey League allowing players, even under the age of 18, to play with just a half-visor, it maybe makes NCAA archaic in a way. It makes you wonder if this is a way to help the players who committed to a college stay there because it would draw closer to the NHL experience in terms of not having to deal with the full-face protection, though I'm sure it's a little more about evolution. Which is a bit odd considering that there's such a huge outcry when it comes to the NHL for more facial protection to be introduced, including the on-again, off-again debate of mandatory visors. More over, I wonder what this does (if anything) to insurance costs should this thing get passed. While it could raise the premiums of certain aspects of the player's insurance, would it be too much for universities to shoulder the load, especially those one a stretched budget as it is?? More over, will there be a big uproar if these creates more mouth/jaw injuries?? All in all, it's a good step in advancing themselves, drawing even with their Canadian counterparts when it comes to recruits. It will make the experience close to the NHL side and not make players stand-out too much. Plus, it won't make USA junior-tier players feel like they're being reverted back to a much younger time for them. Not only all of that, but it would also give the NCAA a more professional feel to the game, even though they are amateurs. In the past, there have been some AGMs with issues when it comes to their health due to playing. This week's AGM's career almost never happened, as he was born with a club foot. With his right leg two inches shorter than his left, it's amazing that he had such a career like he did. This week, the profile of Don McLeod. McLeod started his trek with his hometown team, the Trail Smoke Eaters, but would go 0-7-0 in his eight appearances in the 1963-64 season. In the 1964-65 season, McLeod moved to the Edmonton Oil Kings in the Central Alberta League. While no stats were around for that season, McLeod played 29 games in the 1965-66 season, helping the Oil Kings win the Memorial Cup over Bobby Orr's Oshawa Generals in six games. In the 1966-67 season, McLeod played in 39 games before closing out his junior career. Onto his next adventure, McLeod would go to the Central Pro League with the Fort Worth Wings to start the 1967-68 season, playing in 17 games with a 5-6-5 record; but would get chances in the AHL with nine games for the Springfield Kings (6-2-1) and two games with the Quebec Aces (0-1-0). The 1968-69 season saw McLeod playing in the AHL for the Springfield Kings for 34 games and a 15-13-2 record, while also playing with the Baltimore Clippers for sevens and compiling a 2-3-1 record. McLeod returned to Fort Worth in the 1969-70 season, appearing in 37 games and finishing with an 18-11-8 record. That helped him get a call-up from the Detroit Red Wings in the 1970-71 season for 14 games, but only putting together a 3-7-0 record; but for most the season, McLeod toiled in Fort Worth for 38 games (no record), which was able to get him the Terry Sawchuk Trophy for fewest-goals-against in the season. However, during the 1971 Reverse Draft, the Philadelphia Flyers picked up McLeod and put him in the AHL with the Providence Reds for 19 games (6-8-3) and then the Richmond Robins for five games (1-3-1), before calling him up to the main squad for four games, where he would go 0-3-1. In February 1972, McLeod was picked but the Houston Aeros in the WHA Draft and while he was getting bounced around between the NHL and the minors-- McLeod took the chance with the Aeros in the 1972-73 season, going 19-20-1 in 41 games, and 0-3 in the playoffs. McLeod returned to the Aeros in the 1973-74 season and had a strong season, finishing with a 33-13-3 in 49 games, then 12-2 in the playoffs, helping the Aeros to the Avco World Cup. McLeod won the Ben Hastkin Trophy for WHA's best goaltender and First All-Star Team honors. McLeod was part of the WHA's 1974 Summit Series and would lose the only game he played in, giving up eight goals to the USSR, as the Soviets would go 4-1-3. However, McLeod didn't let that get him down, as he was signed by the Vancouver Blazers for the 1974-75 season, where he would play in 72 games and go 33-35-2. The Blazers would relocated to Calgary and become the Cowboys, where McLeod would play in the 1975-76 season, compiling a 30-27-3 record in 63 games, then 5-5 in the playoffs. In the 1976-77 season, McLeod played in 67 games for the Cowboys, but only have a 25-34-5 record to show for it. As the Cowboys folded, they had a dispersal auction where the Quebec Nordiques would pick-up McLeod, but he would only play in seven games for the team in the 1977-78 season with a 2-4-0 record before he was on the move again. McLeod was traded to the Edmonton Oilers midway through the season and play 33 games with the Oilers and finish with a 15-10-1 record before hanging up his pads. 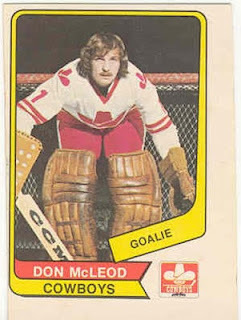 McLeod was 4th in all-time wins for the WHA (157), second in all-time losses (143), and third in career GAA (3.33). Though his whereabouts are unknown (to me at least), the man they called Smokey (due to where he was from and due to having a cigarette hanging out of his mouth at any given time) beat all the odds and did what he had to in order to play the game he enjoyed. He took a chance by playing to start and then to go to the WHA when he was bounced back and forth from the AHL and NHL.